In "The Perfect Family," suburban mother and devout Catholic Eileen Cleary (Kathleen Turner) has always kept up appearances. When she runs for the Catholic Woman of the Year title at her local parish—an award she has coveted for years—her final test is introducing her family to the board for the seal of approval. Now she must finally face the nonconformist family she has been glossing over for years. Her gay daughter, Shannon (Emily Deschanel), a successful lawyer, is about to marry her life partner Angela (Angelique Cabral). Her unhappily married son Frank Jr. (Jason Ritter) is cheating on his wife with the local manicurist. And Eileen's own marriage to a recovered alcoholic is pulling at the seams. This heartfelt dysfunctional family comedy boasts a memorable performance from Academy Award nominee Turner as the conflicted and comical matriarch, alongside a bright ensemble cast including Richard Chamberlain and Michael McGrady. Newcomer director Anne Renton keeps the pacing taut and crafts an honest, modern family tale. Writers Claire V. Riley and Paula Goldberg infuse just the right amount of seriousness and levity into their script, reminding us that family is never truly perfect. 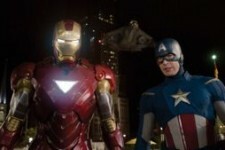 Box Office Preview: The Avengers Finally Assemble!